Following yesterday’s Q3 2010 profit and revenue news here are some important points and numbers from the conference call. â€¢ Appleâ€™s Mac unit sales increased 33% year over year to 3.47 million units, well ahead of IDCâ€™s numbers for the overall PC market, which grew 22% year-over-year. â€¢ Apple wasnâ€™t specific, but said that both desktop and laptop Mac sales beat the overall market. â€¢ iPod revenue grew 4%, even while unit sales decreased 8%…. â€¢ Passed 5 billion App downloads. â€¢ Apple will defer $175 million to buy cases which will be recognised upon delivery to customers. â€¢ $2.17bn made on sales of iPad and accessories. 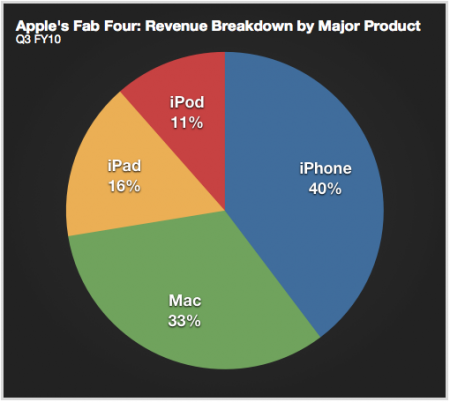 iPad sales alone was about $2.1bn…. â€¢ On the issue of the iPad cannibalizing the Mac, it was suggested instead that a kind of â€œsynergyâ€ could happen. Looking at the iPod, it was â€œfelt the iPod created a halo for the Mac,â€ as â€œiPod volumes took off, you see a dramatic change in Mac sales back in time.â€ And people thought Apple forcing the iPad to be tethered to a computer was a mistake. These points are listed on: The Mac Observer – World of Apple – The Apple Blog – Edible Apple. Thanks for your personal marvelous posting! I quite enjoyed reading it, you can be a great author.I will make certain to bookmark your blog and definitely will come back later on. I want to encourage you to continue your great posts, have a nice day!